What a last couple of days.. mother nature likes to remind us from time to time just who is really in charge. If you are in a position to help, visit the Red Cross and make a contribution to help those that have been affected by the storm. So after a few days of cash market inactivity, the market continues to trade within last week's range. However, there is strong support in at the 1405 level and there is now an inverse head and shoulders targeting 1430+, so the market could stage a rally from here. If the 1405 level does not hold in the cash market, I think we will go for the market's ultimate goal of the 200 day ma which is now close to 1380. European and Asian markets have been reversing or rallying, so a strong counter rally from here would fit the overall global picture. 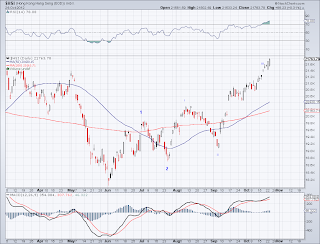 I am thinking of buying back XIV with a 1405 stop (if we don't gap up) or at the 200 DMA for the counter rally. But as of now, I am 100% long China and HK. The market ended putting in a significant bearish leg to 1400 in pre-market but the early GDP report lifted futures and the market recovered after the announcement. So whether the market is ready to start rallying to the 50 DMA yet remains to be seen early next week. 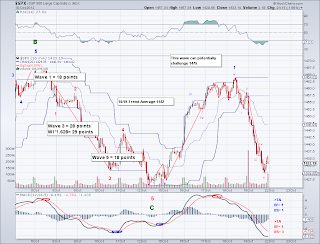 Market is oversold and sellers will start getting exhausted so we might see a violent rally after a bottom is found. I still think the ultimate target for the market is the 200 DMA in the 1370's, so we'll see how long it takes to get there. Also, the sell off after hours coincided with the emerging market's 4th wave and perhaps all markets around the world will rally on the counter rally and that's where I will be selling :) Fundamentally speaking, the GDP numbers out today along with the UK and China numbers do look somewhat good. Obviously, it is still early to tell where the wold will be by next year but if economies can gain traction here, corporate profits will start improving and give the markets a reason to rally to higher highs. So I hope economies around the world continue to improve as we've had enough of financial crisis already. Despite today's less-than-stellar global economic environment, as recently as April, crude was trading well over $100 a barrel. The market kept trading sideways today but made a slight lower low and the lack of bullish impulse has now turned the intermediate trend down as well. The market could still be working on another wave down so it's not clear where the market will be near term but the bearish intermediate trend change is essentially confirmed so I exited the XIV position at 16.10. 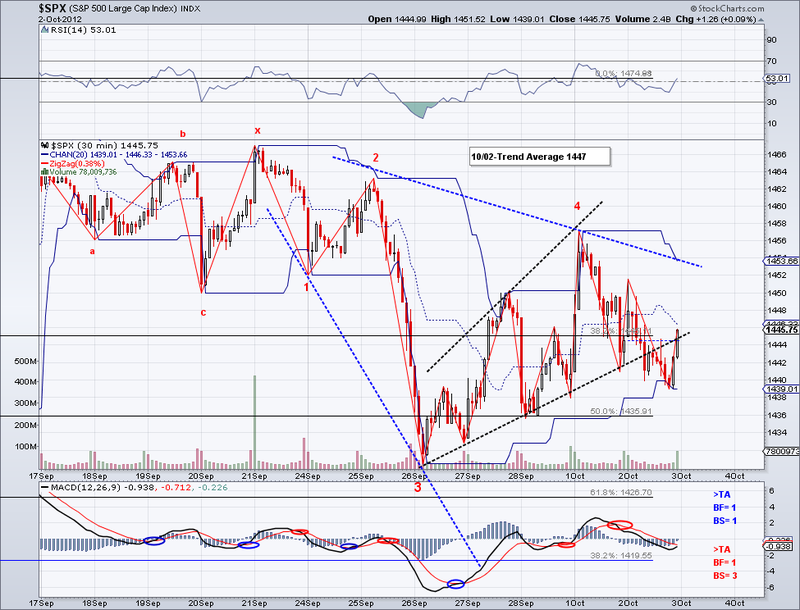 I'll buy it back when the trend changes to the bullish side after the market finishes doing its correction. If anything, I might buy back some VXX at the test of the TA/50 day ma to hedge my emerging market positions.. which have now gone up for 10 straight sessions! In couple of years of doing this, I don't remember a time when the US was selling off while emerging markets were going up by this much. Perhaps, some people are doing the same thing I did which was taking profit in the US and shifting it overseas? whatever the case, lower lows are now likely for the US market and new opportunities will be found when the correction is over. 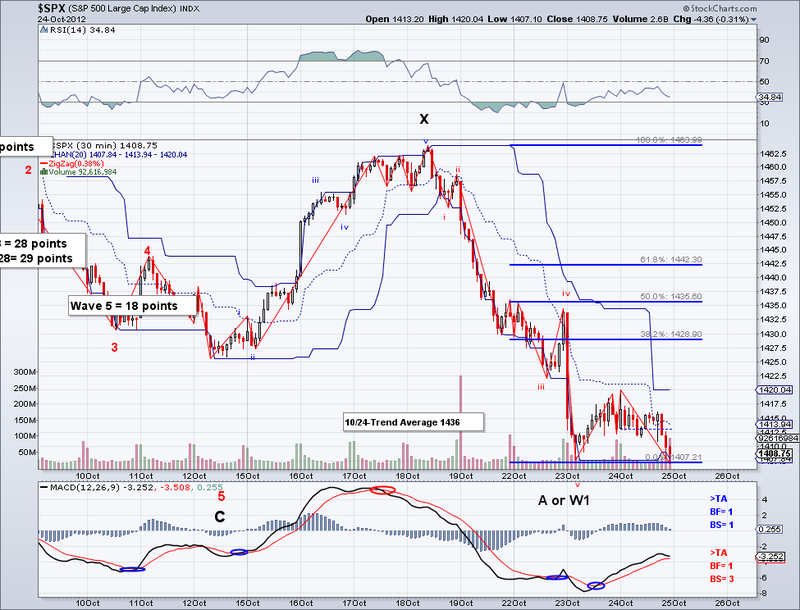 The market staged a mild counter rally that was reversed by the end of the day. So going by wave structure alone, this could be another W4 before another lower low. If a descending triangle develops, we'll be able to project more or less where is the downside target. 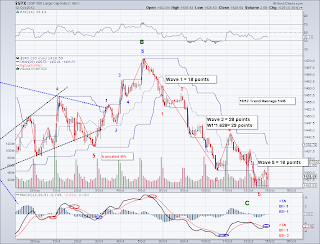 Normally, a wave proportionate wave is able to project downside, like the "perfect 5 wave" count I posted couple of weeks ago. But when you get an odd looking wave, there is no projection until key support levels are hit and certain patterns appears (forget RSI, oscillators, etc. they are not accurate when it comes to stronger waves). So with that in mind, the structure looks complete to me and perhaps the market is just doing an ABC Flat or an expanded triangle before rallying to the TA/Fib retrace area. 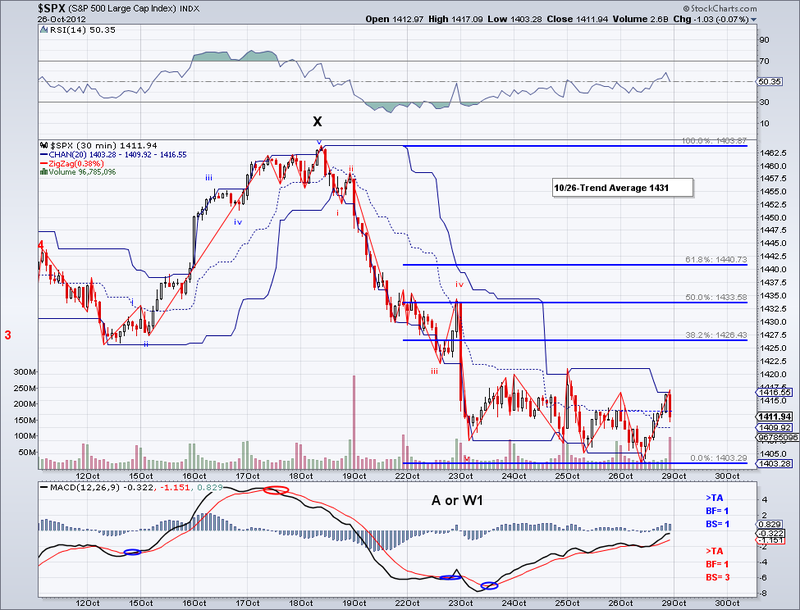 I am still holding my XIV so I can sell hopefully at break even or at profit on the "real" counter rally. Also, I wanted to add the chart tonight for Hong Kong (My favorite emerging market). It has gone up for 9 sessions in a row and if it rallies again today that'll be 10 for 10! 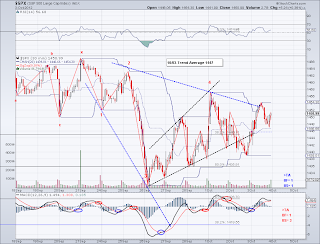 that's a real bullish W3 there and it makes my point of oscillators, RSI, fan lines, etc. being useless on stronger waves. Anyone would be tempted to take profits at this point but I am not touching it until 5 waves are done there. Money is obviously flowing to undervalued emerging markets and this is where money is going to be made in the near future. Also, gold is almost a buy if you believe in the cup and handle pattern. I'll probably add some gold positions on some more selling. 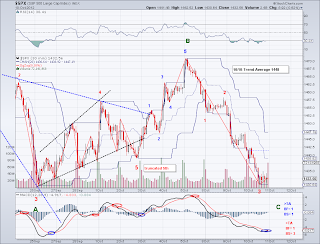 Assuming this bearish wave in the US is an "A", then the time to buy gold will be at the end of "C".. Easter Island here I come! lol. 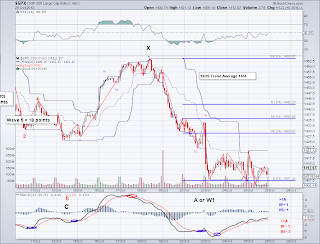 Short Term Trading Strategy: Bought XIV @17.64 as of 10/19. Selling XIV position on the counter rally. I was expecting lower lows yesterday after a bounce but the bullish wave got stopped on its tracks and today we got a significant sell off. Technically, the market is now oversold and a strong rally is coming that should test the Trend Average currently at 1439. Whether or not this wave will be able to re-capture the TA is up in the air but I favor another leg down after the test to the 200 day ma. So we'll see how the market evolves in the next few sessions. 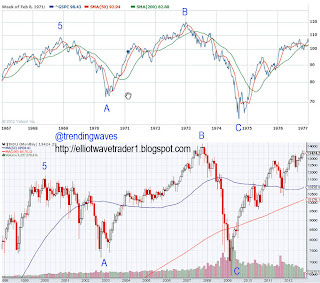 This counter rally would go well with a 5th bullish wave in the emerging markets. The problem is there hasn't even been a 4th there yet, so it's interesting to see the US selling off and "riskier" markets go up. Which is the complete opposite to what usually happens. 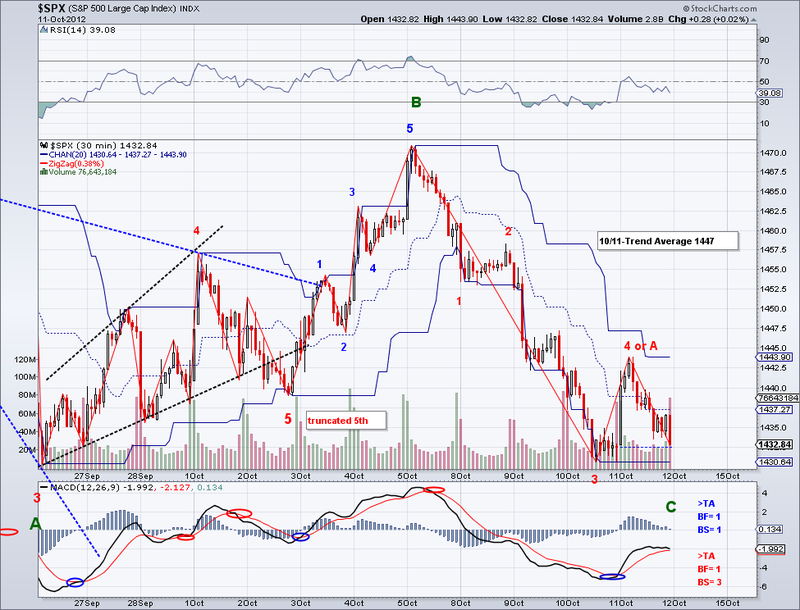 Also, gold is approaching its Fib retrace area and will be a buy very soon. Lastly, I should add that unless the market pulls the TA back up, the intermediate trend will turn bearish and that is a sell signal. I believe the market is just doing a normal correction, nonetheless the opportunity to benefit from short positions is on the horizon unless the markets can pull one out of the hat. 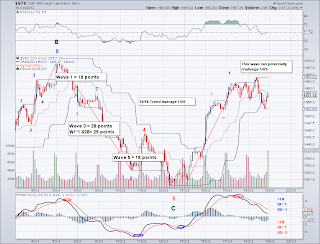 The market had another wave in it and a lower low was made with the final 5th that we saw today. This lower low is significant in that it turns the weekly trend down and unless the market can rally back up and make a higher high, chances are the market will head towards the 200 day ma. Something which I thought was not going to happen when the now "X" wave appeared. So I will be adjusting my trading (the US based trades that is) to reflect this change. 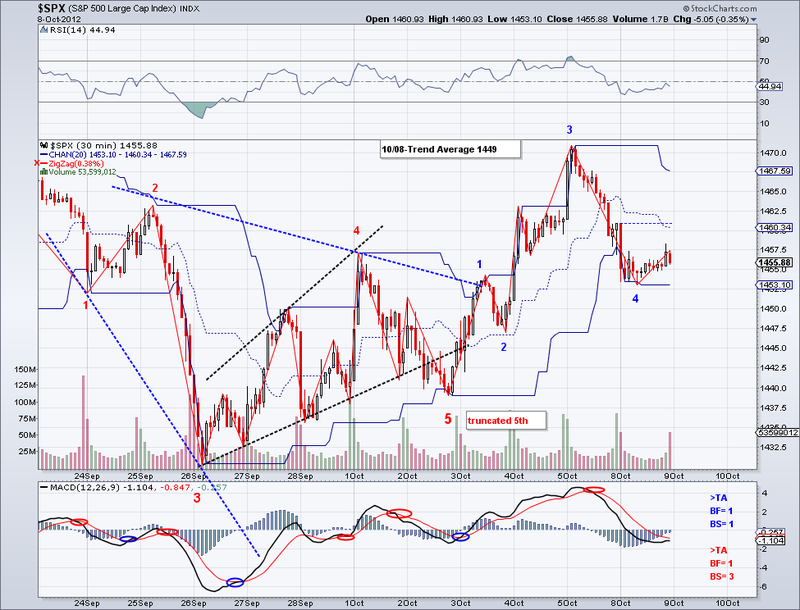 The market will probably go for the trend average and possibly to 1443 before resuming another bearish leg. With that said, the emerging markets I am in right now did not even notice the US sell off on Friday as they just kept going up. And that to me indicates the risk on trade is alive and well, so I don't foresee any steep sell off as long as the 200 day ma is maintained. And to make something clear, I moved over to emerging markets because the potential for upside seems to be greater there. It doesn't necessarily mean that I think the US markets will tank, I believe as long as the intermediate and long term trend continues to climb that this market is going going for 1500+ regardless of what fundamentals are in place. This is a Q3 rally, nothing more than that so using earnings to gauge this rally stopped working in the summer. Real sell off or W2? The market staged a somewhat surprisingly strong bearish wave today and the uptrend that was established just couple of days ago is at jeopardy. However, not all is lost on the bullish side as the sell off today failed to make a lower low. Looking at this wave, I see 5 waves complete to the downside and I see the exact same dilemma as I did just couple of days ago with the bullish wave. 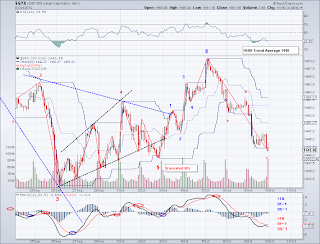 The 5 waves in place could be just the end of a bearish W3 or the end of 5 waves. 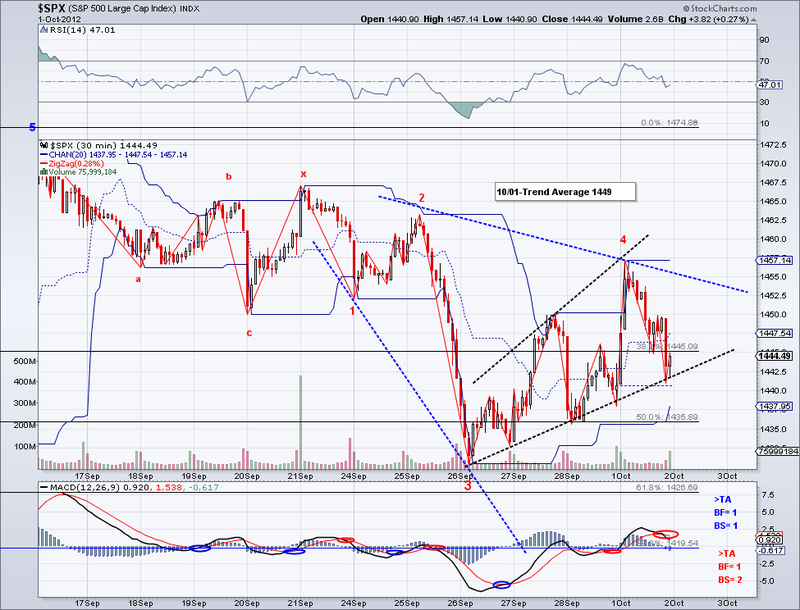 So we have to see how the market bounces and on this one, but again the key level to watch is 1425.53. A lower low will indicate lower prices ahead, a strong rally on Monday will be a signal today was just a test for the bulls. Also, the market magically closed at the 50 day MA so again the same reasoning I used last week applies here, people who are convinced this market has legs will jump on this. Failure to hold the 50 day ma will mean the market is likely to test the next support level which is 1373 or the 200 day ma. I should have kept my VXX yesterday! but again, I missed out as I should have just stuck with the 5 waves I labeled. 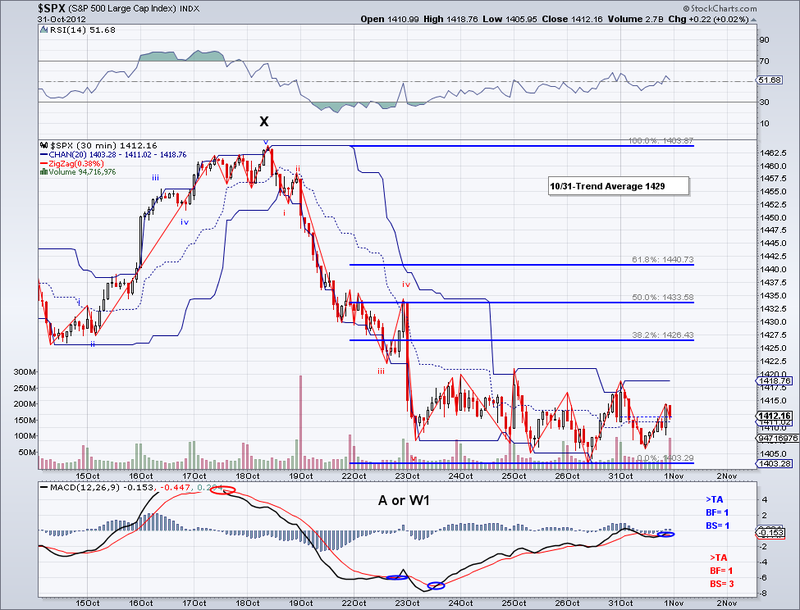 But today I bought back the XIV position at 17.64, so we'll see how that goes next week. 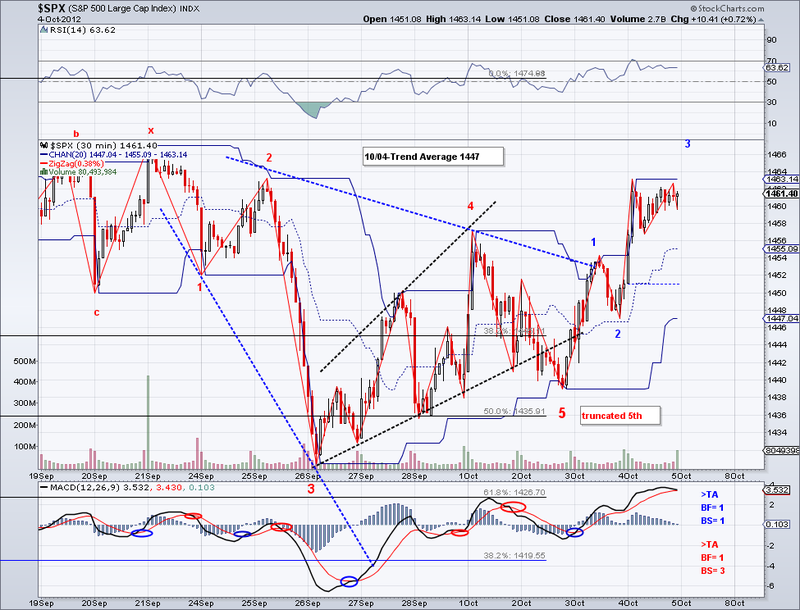 A breach of 1425 and I'm out, recapture of the trend average in a W3 and I will ride it. Lastly, the sell off today fits perfectly into the start of a W4 for emerging markets which would indicate there is another bullish period coming soon before we get a stronger correction..
Short Term Trading Strategy: Bought XIV @17.64 as of 10/19. Selling and hedging longs depending on how the market trades around the Trend Average test which is coming soon. New high on the next rally? 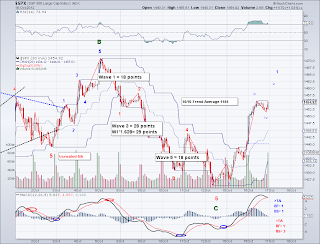 The market did top yesterday as the 5 wave count on the chart indicates. 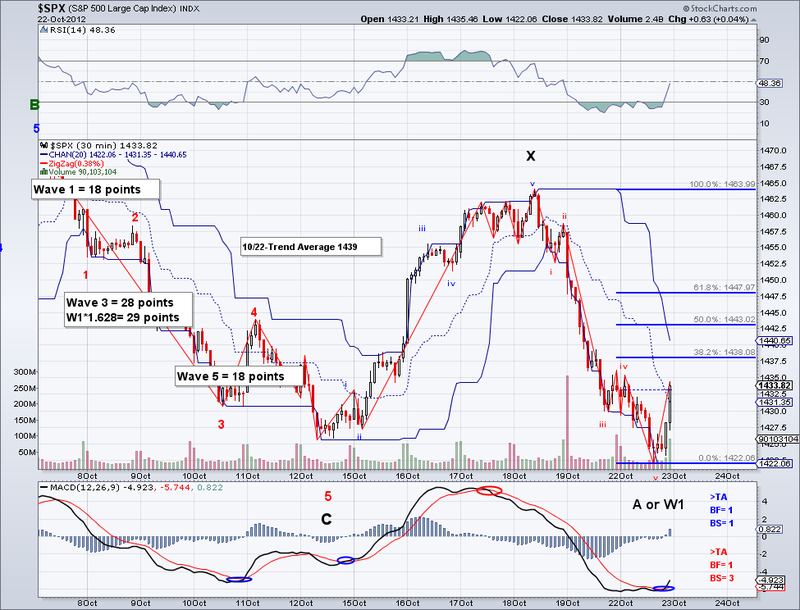 But I am leaning towards labeling yesterday's top a bullish W3 due to the lack of profit taking. Arguably, there is a small broadening top in place but I get the feeling the market is just buying time before launching another assault on 1475 in the next few sessions. Had Google not dragged the Nasdaq the way it did today, the market could have conceivably challenged the 1475 resistance. And btw Google happens to be one of the very few stocks I would actually buy to own in the long term, their margins are being affected by its mobile ad platform but they have many other potential revenue streams. Fundamentally, Google's technology is second to none. I've worked with Google search on some projects for many years and no other online platform comes close to them. 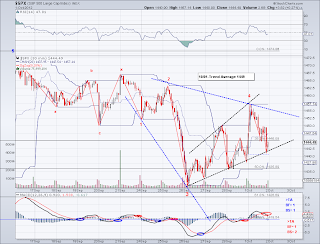 So if anything, I might end up buying some of its stock if the sell off continues there. I ended up going with my instinct today and I closed my VXX position at 33.12, technically just a break even. 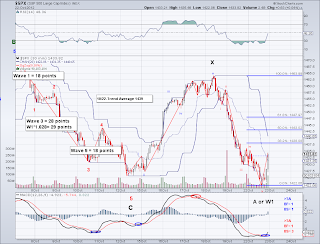 Short Term Trading Strategy: Closed VXX @33.12 as of 10/18 - Bought VXX @33.10 as of 10/17. 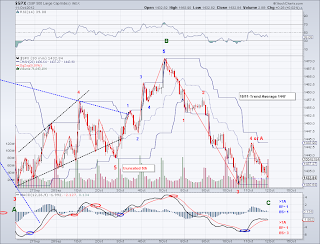 Waiting for a 5th wave to materialize to buy back VXX or a triple SP500 short. Technically I should be posting the charts today separately but for the sake of time I am putting them on the same post. So first I will go over today's market and second I will follow up on my post on why I think the 12 year correction might be over soon. 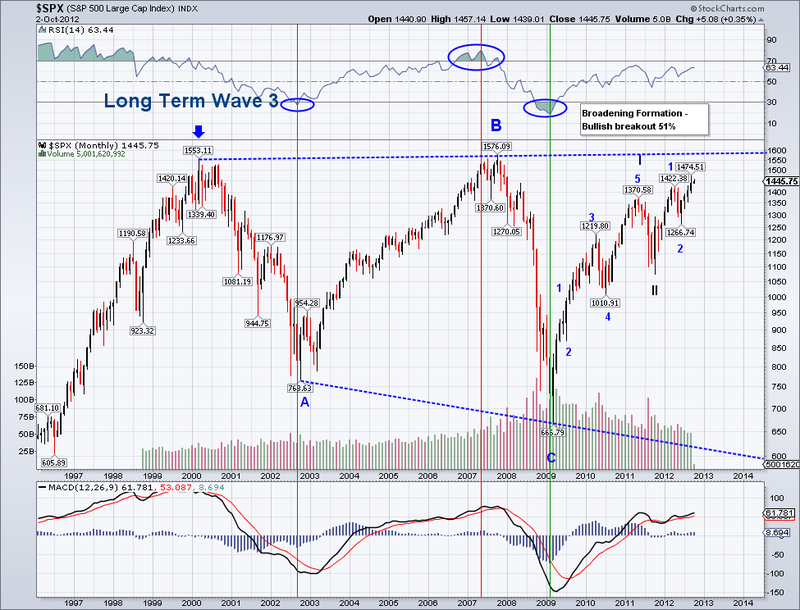 First the SP500, is there anyone out there who still thinks we're going sub-1400? As I have noted on my September 6th post, people who missed the rally were probably going to jump in at the 50 day ma there is no doubt that's what happened. The market is now aligned with other markets (most notably emerging markets which have been sky rocketing) and SP500 @ 1500+ might just be around the corner at this point. I see 5 waves complete on this bullish wave but it is not as neat of a structure as the "perfect 5 wave count" I posted about last week. So the top today could just be the end of the nested W3 and if that is the case, we are going to get new highs for the year in the next few sessions. I continue to regret selling my XIV early but I am enjoying my emerging markets longs, in fact I am tempted to lock in profits but I am going to let them ride to the sky :) What I did do today was buy XIV's cousin, the very dangerous VXX at 33.10 which in pre-inverse split prices would equal to 8.27!! it wasn't not all that long ago I owned thousands of these things at $20+ and good thing I usually sell them fast.. next time I might just use SDS or triple shorts to hedge, at least they seem to be more clear. 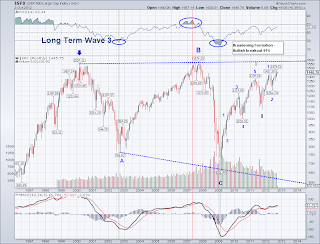 Now the following is the follow up from the post on the end of the 12 year correction. So first, take a good look at the chart. As I've said numerous times before, I don't trade on long term counts and I wouldn't advice anyone to do so either. But these are interesting to look at and they can provide a guide to riches and right now the option of a break out of the 12 year pattern is becoming very likely. But first let's deal with some basic Elliott Wave theory, one of my basic rules is I do not believe in any type of "Cycle" work. It is pure BS as the people who came up with it failed to account for inflation and real GDP growth. So instead we see charts of "what would have happened" if we priced the market in Gold, etc.. pure BS! 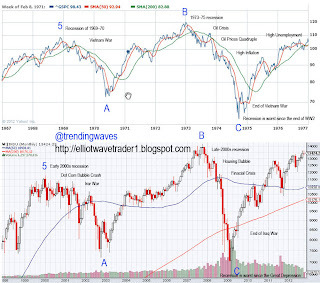 What has happened since WW2 is the market going up in strong W3 like rallies that are broken in 5 waves. After these strong waves, markets have either consolidated sideways in multi-year corrections or have dropped and recovered quickly. In looking at the charts, the last time we had a multi-year sideways correction was the period I posted on the chart (before that was in 1955-58). And if you take a clear look, years from 1967-1977 are almost identical to 1998-2012. The US dealt with long wars, recessions, high unemployment, high oil prices, etc. But what happened after the 1977 period was a couple of years of slight higher highs and lows before breaking out of the pattern and tripling in price within 10 years time, this after being stuck in a trading range for almost 10 years. So now we find a very similar situation and there is a good possibility markets are about to break out of the pattern and go up for 10 years as other breakouts in the market in the past. And while I understand there are many bad news around, how do you think the news were in 1977? they were dire but look at what happened. Also, one index that might give us a clue is the Russell 2000. It is close to breaking its all time high and should this index break out of the pattern so will other markets. The RUT has always made a new high along with the other markets, so odds are if the RUT makes a new all time high so will other markets. As to what will fuel the new multi-year bull market is anyone's guess. It could be an inflation driven rally, emerging markets, etc. But what matters now is that the long term trends on all major markets are pointing up, so maybe is time for a good ride up. And I'll leave you with the debate from 1980 between Reagan and Carter. You can see how similar some of the issues are when compared to the debate last night between Obama and Rommey. 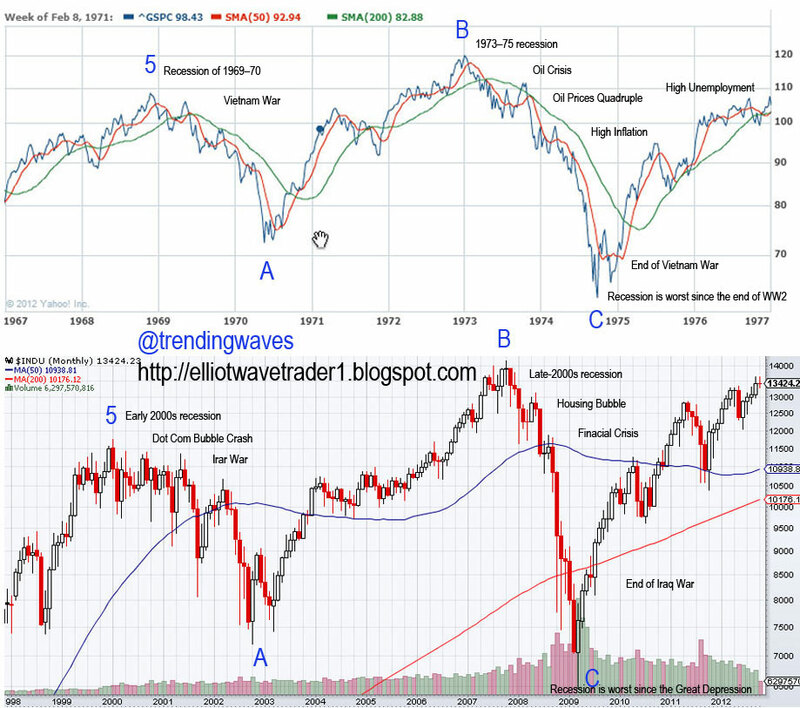 End of 12 Year Correction? I wanted to post these charts tonight so you guys can think about it. I would never trade based on a long term Elliott Wave chart but it's good to have this possible outcome in mind as it can literally make you (or save you for that matter) a lot of money. I'll post more tomorrow on what are some of the events that support a break out of this pattern the markets are in.. I'm watching Obama and Rommey going at it. The minute wave count I had yesterday was off in that I thought it was a complete 5 wave count, instead it turned out to be a bullish W1-2 nested count so we got the W3 today and the fade can be counted as a W4. 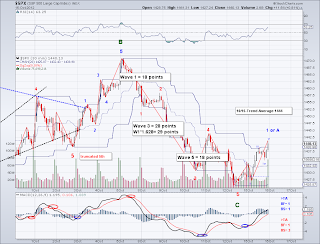 So too bad I sold my XIV yesterday (I still made a nice profit so technically I shouldn't be complaining) but at the same time the strength shown today proved my point of people jumping in at the 50 day ma, so I am leaning towards this wave being a bullish W1 of a count that will make new highs for the year. The market closed comfortably above the trend average and a successful test of TA on the retrace would further cement the 5 wave bullish count. Also it would be hard to reconcile emerging markets rallying if the US market is going for the 200 day ma.. we'll find out soon. 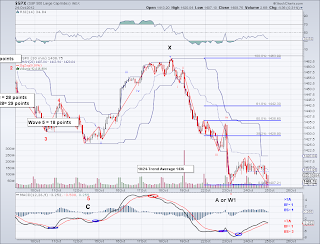 Short Term Trading Strategy: Closed XIV @17.78 as of 10/15 - Bought XIV @17.33 as of 10/12. Selling and hedging longs depending on how the market trades around the Trend Average test which is coming soon. Bullish W1 or A Wave? 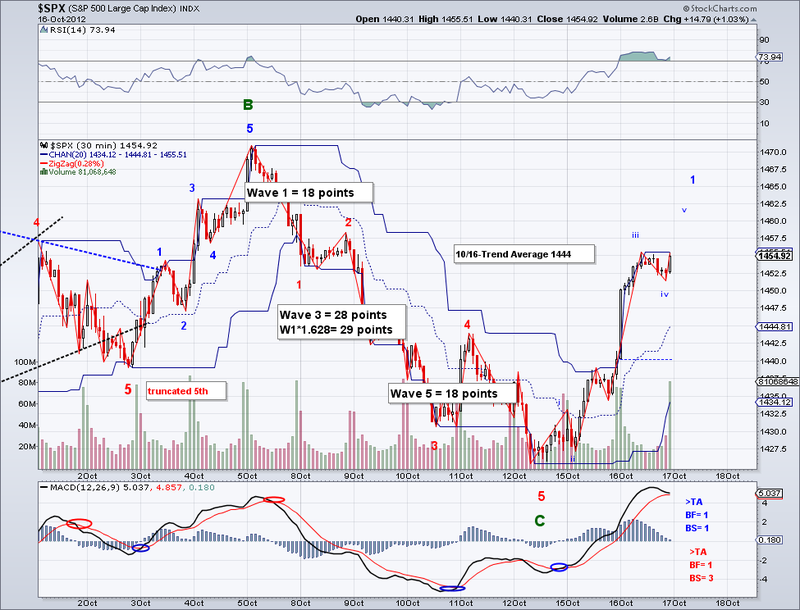 The market behaved as I had hoped and did not mess up the perfect 5 wave count I had posted..lol. So now we are seeing the bounce after an initial successful test of the 50 day ma, again as I had said previously on my post from early September. 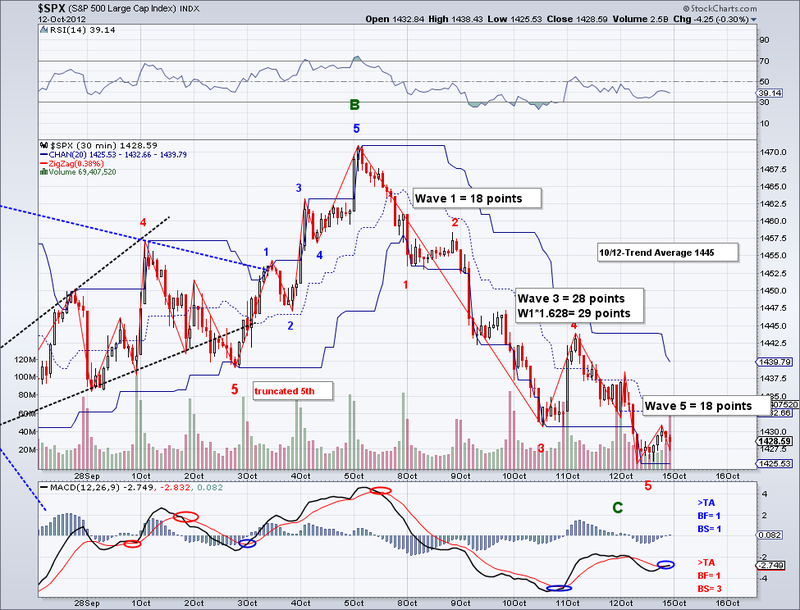 The big question now is whether this wave is going to be a W1 or an A on a short term basis. If we get a strong W3 then odds will favor the market challenging the year's high again. Obviously if we get an ABC then the market might come down further and meet the 200 day ma. I sold the XIV position and I will be buying again at the B or W2 and then see how the market behaves at the test of the trend average. "My guess is that eventually those people who missed the rally will either start jumping in right now or wait for the 50 day MA test which I can almost guarantee it will come after this wave is finished. 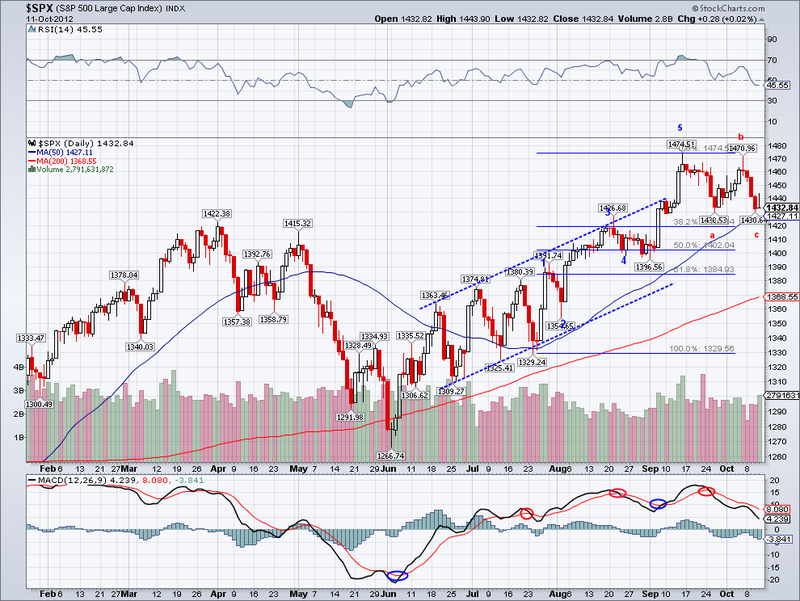 The question is will the 50 day MA be 1400+ by then?" Gold looks like it is finally starting to form a handle for its cup and handle pattern and the emerging markets I bought recently are on a bullish wave 3 despite the sell off in the US. So when putting everything together, odds favor the bulls and this sell off is a correction. I technically have no skin the game (As in the US market as I moved all my longs to Emerging Markets) but I couldn't resist the perfect 5 wave count today so I bought some XIV (the inverse of VXX) on margin for some coffee money :) How the market bounces or rallies towards the trend average could give us a better picture of what's in store for the remainder of the year. 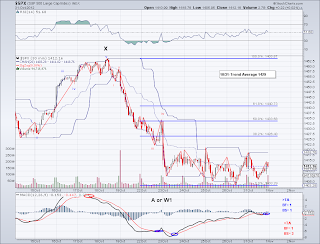 Short Term Trading Strategy: Bought XIV @17.33 as of 10/12. Selling and hedging longs depending on how the market trades around the Trend Average test which is coming soon. Correction over or W4 counter rally? The market technically reached the 50 day MA in after hours yesterday and today's bounce should be a W4 counter rally. However, since the C leg is technically equal to the A leg (if we count afterhours), there is a possibility of the bounce today being a bullish W1. 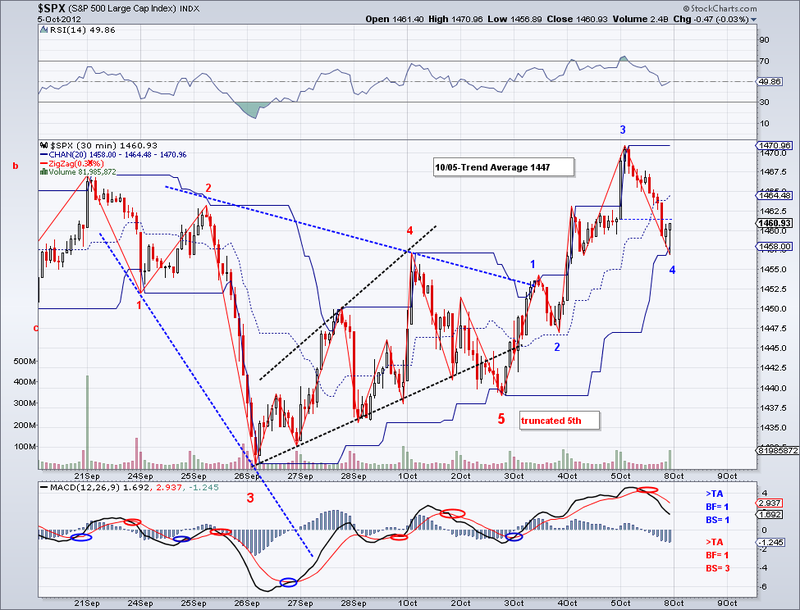 Whatever the case, I posted the intermediate count on how this correction from 1475 looks like. So far it looks like a "Flat", which is just consolidation before another rally. 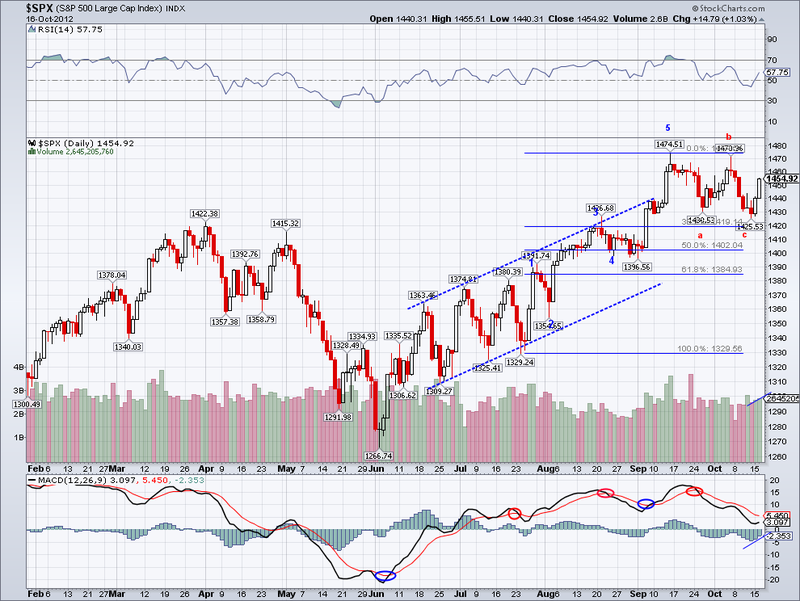 But we'll have to see if the the market wants to correct more before another attempt at another high for the year. Emerging markets are looking very strong and that suggest more upside to come after the correction is over. 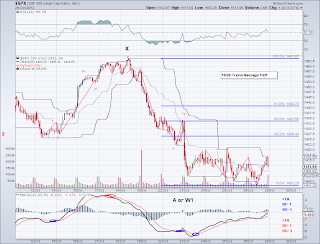 I almost hedged today but the market did not make it to the TA, so I am in wait and see mode. 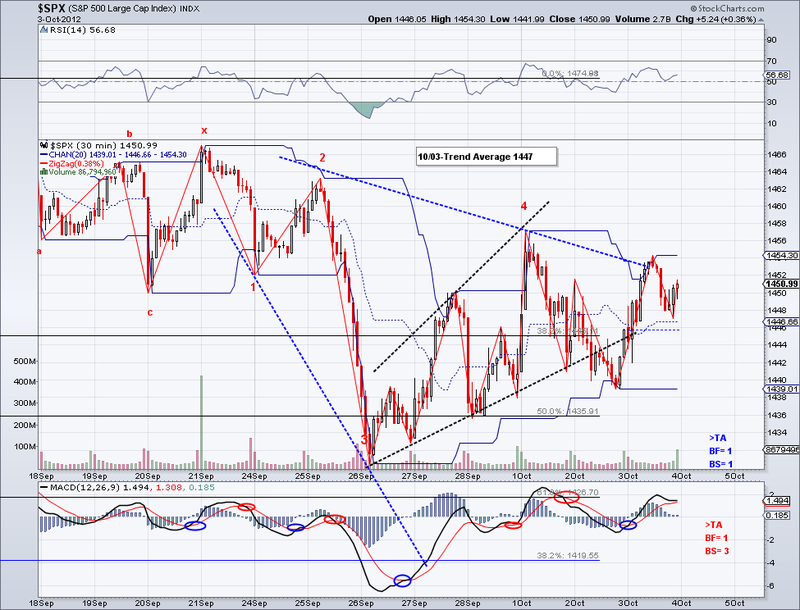 I don't want to get caught in a bullish W3, so the leg tomorrow should bring some clarity. 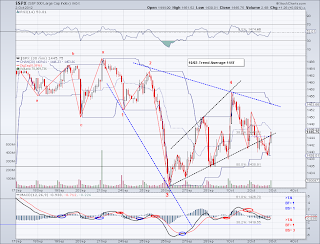 The market continued its sell off today and now we have a confirmed bearish short term trend. Also, the picture looks a lot more clear with the waves are impulsing so I made some changes to the count and I am expecting a test of the 50 day MA in the cash market or in pre-market. Few weeks ago when I announced we had seen a likely top, I called for a test of the 50 day MA. But the initial corrective wave was so choppy, that it seemed like the market was ready to rally back to a new high (which the DOW did but not the SP500). 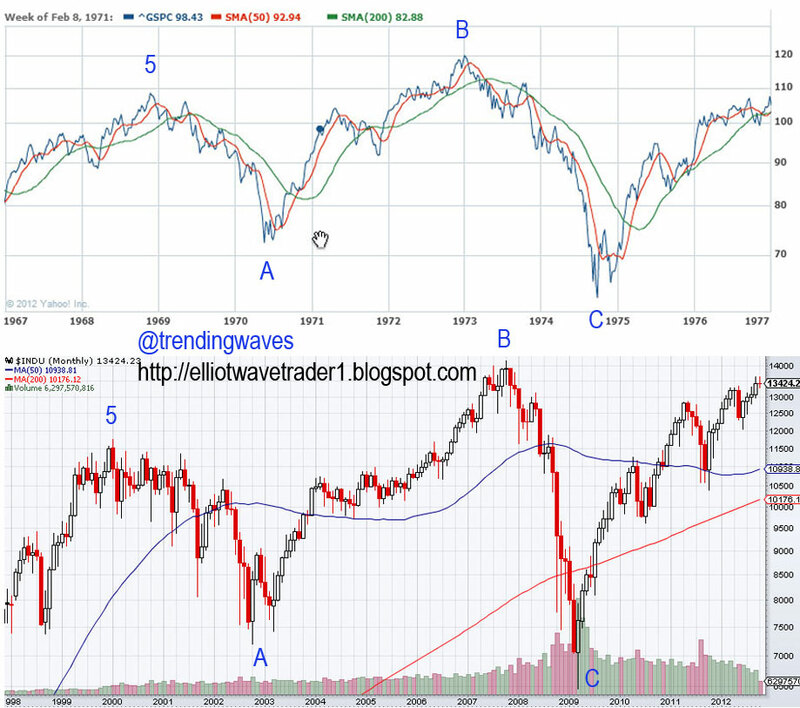 But now it looks like we are in the "C" leg of a correction and if C=A, then we would test the 50 day MA in the 1420's. The 1430 level I mentioned yesterday served as the low for the day and perhaps it will continue to hold as a bearish W3 low. But it seems like there is on more leg down before seeing the start of a "real" rally. I will be adding some hedges on the bounce but I'll also be careful not to get caught in a violent rally that will likely happen should the market not take a break from selling here. Short Term Trading Strategy: Closed VXX @8.98 as of 10/01 at break even. 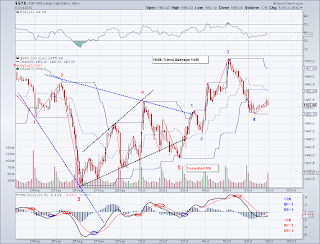 Re-hedging if market loses TA support. 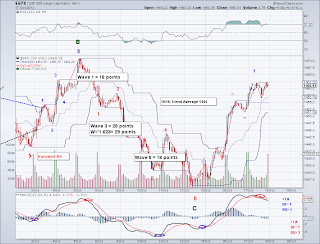 The market continued its sell off today and in turn invalidating the 5 wave count I had been following. It does seem however that there was a 5 wave count on the last bullish wave and current sell off remains a correction until critical levels are breached. 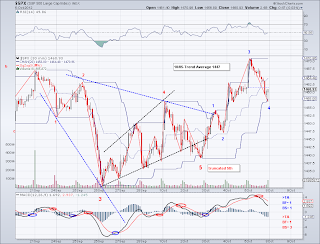 Some important key levels to watch are a) 1439 and b) 1430. If these levels break then the market is going for the 50 day MA for sure and even the 200 day MA at 1366 as of today. But assuming we are going much lower is still premature until the trend actually changes. 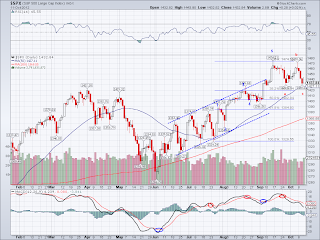 The market closed somewhat comfortably under the trend average and it remains to be seen if the market can re-capture it on the next bullish wave. I will be re-hedging again if the market fails to capture the TA on the bounce, otherwise I remain 100% long. 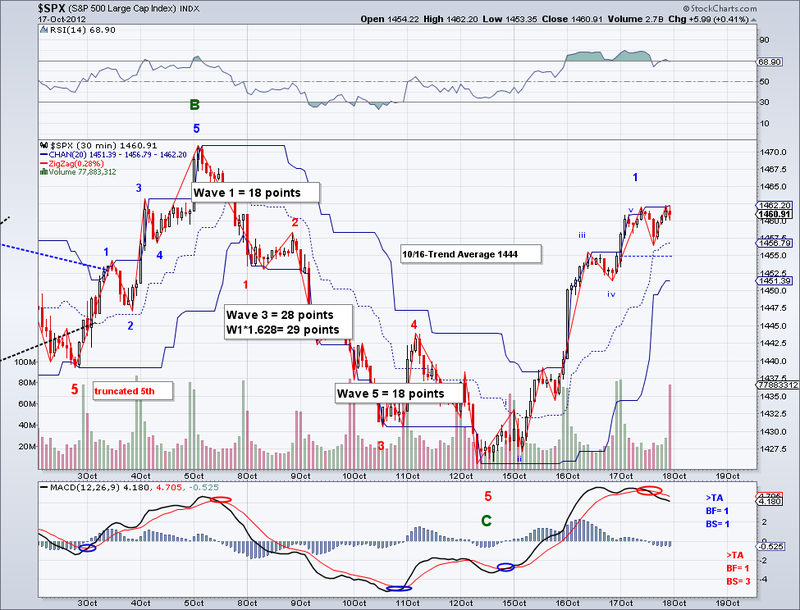 The market correct a little more than ideal today in the sense that it went into the wave I've labeled as Wave 1. 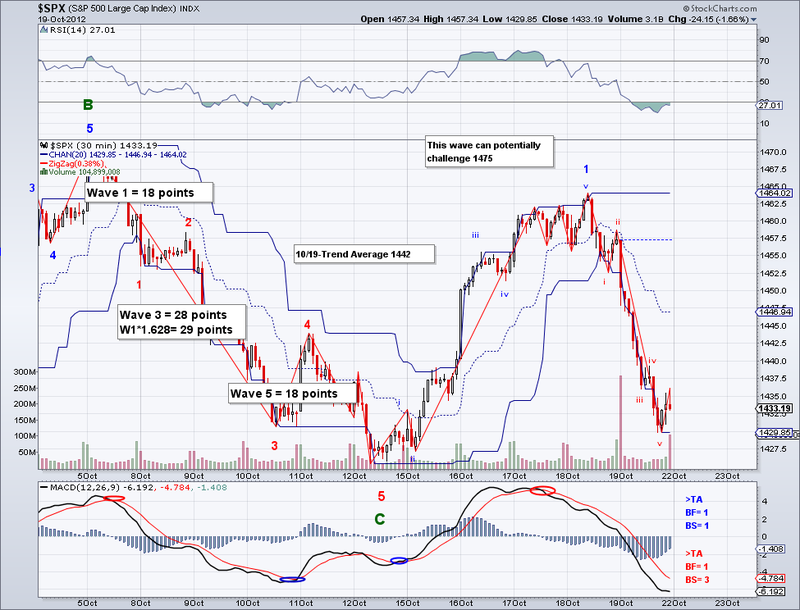 And under orthodox wave counting, this breach of Wave 1 territory would invalidate a 5 wave structure. 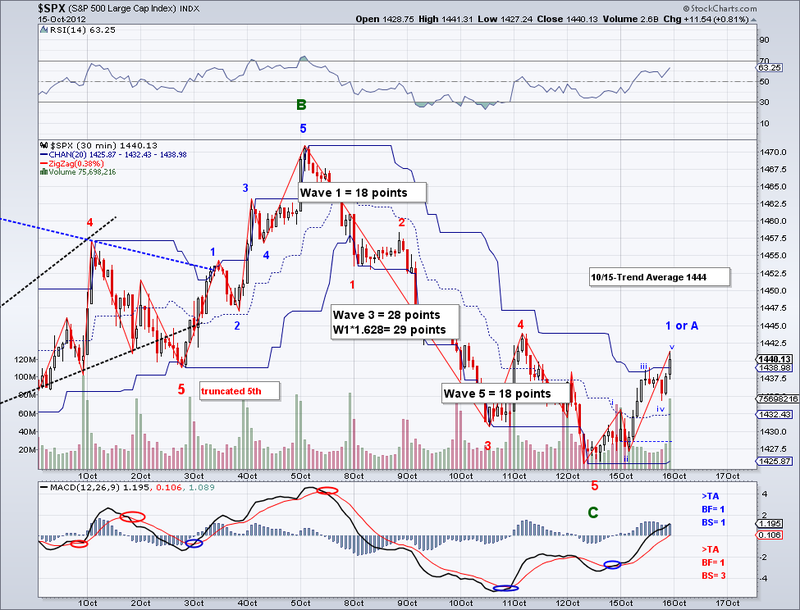 However, since I have my own system here, I am continuing to label this a Wave 4 as long as the trend average holds. And looking at the MACD, it seems like the market will be ready for another upswing as soon as early tomorrow so we'll see if this coming bullish wave will take this year's high of 1475. Short Term Trading Strategy: Closed VXX @8.98 as of 10/01 at break even. 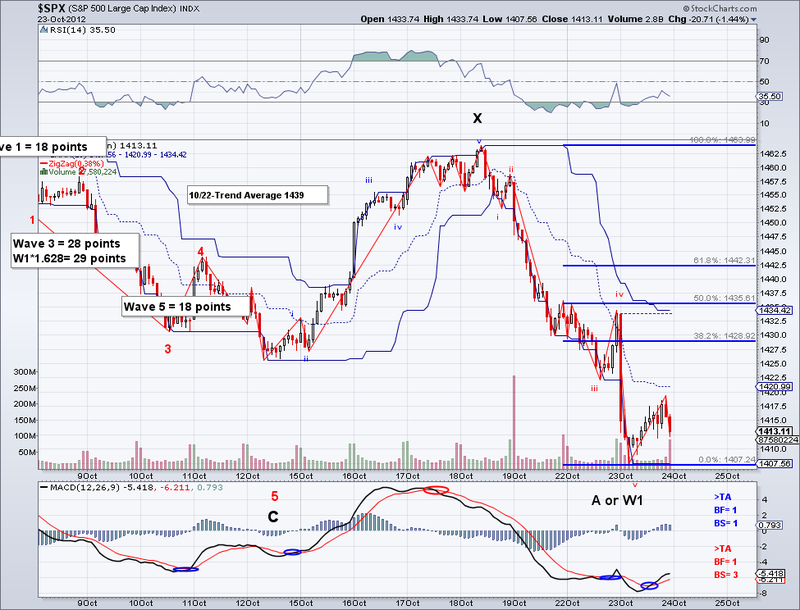 The market continued its bullish W3 earlier today but it seems to have faded on a W4 after the initial morning rally. And although the SP500 came close to its 4 year high, the DOW made a new high already and in turn confirming the likelihood of a continued rally to higher highs as I speculated few days ago. 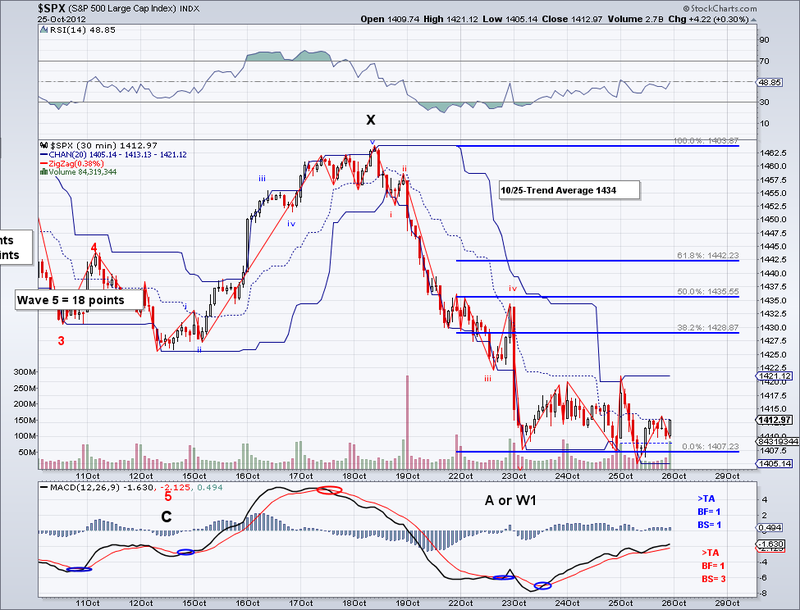 One level I am watching carefully is the 1454 W1 high so we can have a good 5 Wave impulse to the upside. We have a bearish cross on the 30 min MACD but these usually happen on W4's, so ideally we would see a rally on Monday to challenge the year high again for the W5. On a side note, emerging markets are officially in a long term bullish trend so I am keeping my fingers crossed. Also, I was checking VXX in the morning to see how much money I saved by getting out at break even and I saw it was a $32 something. Considering I had sold it at $8.98, I thought something must have happened. And it was a reverse 4 to 1 reverse split and the equivalent closing price today was around $8.50.. so it goes to show how dangerous this particular ETF is. One can make a lot of money but it can wipe you out as well if you are not careful. I remember earlier this year I was trading it when it was in the 20's and now is -60%.. The responsible thing to do by the companies issuing these ETFs would be to limit them to certain types of traders as many people don't even know how these VXX work in relation to the VIX. Or at the very least give people a very clear warning.. The market closed up again today and the market is again short term bullish. 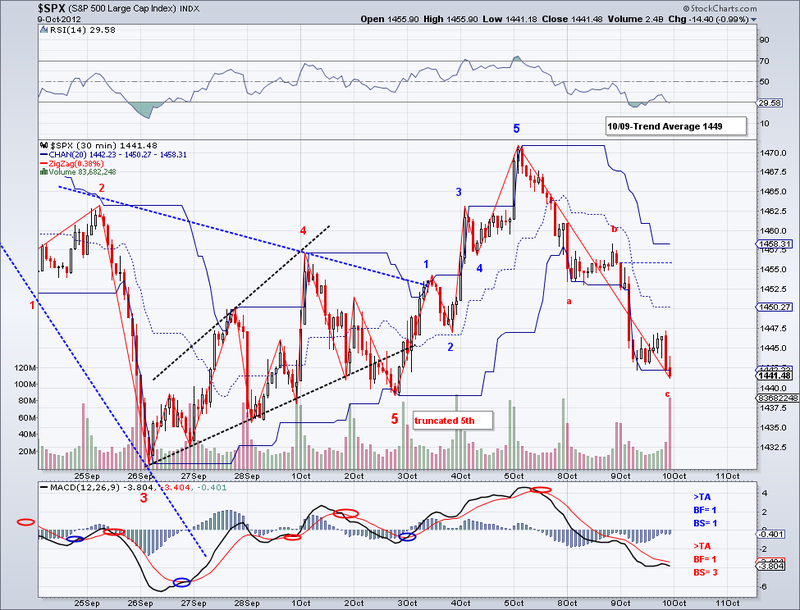 And my hunch that the 5th on the bearish wave was going to get truncated a few days ago turned out to be correct. So now we are potentially seeing the bullish wave that will make a new high for the year. Where is the market headed is anyone's guess given the Q3 environment but as long as the trend is up, the market will continue to go up so I would advice people who are still trying to short this market to do it only under the Trend Average or very carefully. I've been saying this since June and those who didn't believe in my simple and free TA system are paying for it. The market is setting itself up to challenge 1500, a level many people thought impossible not all that long ago. Market getting ready to rally? It's been almost 3 weeks since the market topped at 1475 and after almost 3 weeks of sell off attempts, the market is less than 2% off its high. Also, the close today was above the trend average and should the TA hold then we can expect a rally to high 1400's at any moment. So so far it seems like my "instict" trade of getting off my hedge couple of days ago seems to be correct. 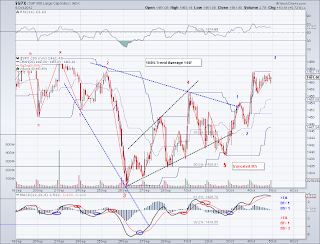 Looking at the chart, we see a series of higher lows (which is bullish). There is however the bearish head and shoulders still in play but the market capturing the trend makes it less likely to occur. So we'll see how the market reacts to news in the next couple of sessions. I am now maxed out on emerging market stocks so hopefully we'll see a mad rally in the emerging world. 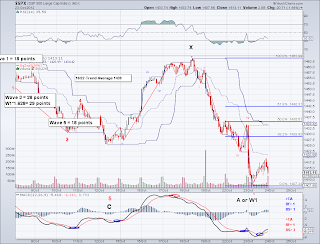 Is an Intermediate Bullish W3 coming? The market managed to do another song and dance today without giving clear direction. And again there is another Head and Shoulders pattern targeting low 1420's and considering the 50 day MA is at 1415 and rising couple of points per day, I wouldn't be surprised if that is the level the market is targeting. Whatever it is, whenever I see a market trading sideways like this when both long and medium term trends are bullish it just means gains are getting consolidated. So I am expecting a rally sooner rather than later to challenge 1475 if the 50 day MA holds. What will be interesting is if we are going to get a supper bullish wave per the long term chart I posted, if we get a wave that is 100 points plus then it will make the long term count likely and perhaps we'll see the start of a multi-year bull run. Obviously, I don't like trading using these long term charts as there can be many outcomes but just a breakout of the ABC pattern would yield really good gains. And considering emerging markets are turning bullish now, I really wouldn't be all that surprised. 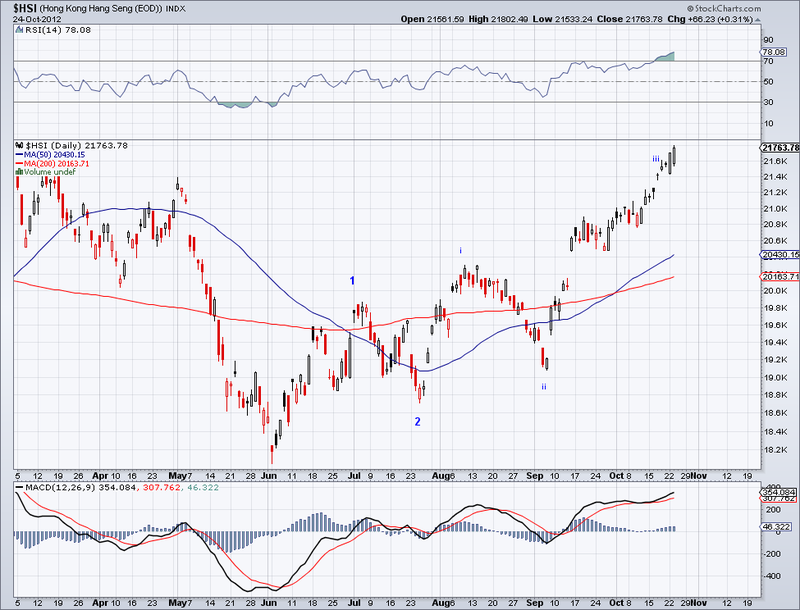 I am buying a bunch of emerging market equities in the next couple of days and I am betting they will at least double. It might take months or a few years but I will be riding these to collect the generous yields (4% plus.. which is actually higher than the 3.4% mortgage rates on the 30 year fixed) and really take it easy when my target for them is reached. The market managed to breach the trend average today but it could not sustain that level. And at the same time the traditional 5 wave count I was posting was essentially invalidated so instead the market has an expanding diagonal form targeting a bit more downside. At the same time, we can also see the Ascending Broadening Wedge marked as W4 and although the bearish target is the W3 low (essentially favoring W5 truncation), this pattern usually appears in bull markets. So odds are now starting to favor a continued run towards 1500's. And in light of this, I decided to let me hedge stop out at break even (these VXX are extremely volatile and not good to hold for more than a few days) despite having a close under the trend average and a good probability of some more downside. I'll re-evaluate the hedge depending on how the W3 low gets taken out (if at all).. so I guess you could say I am letting my instinct run on this one instead of my mechanical TA trade. 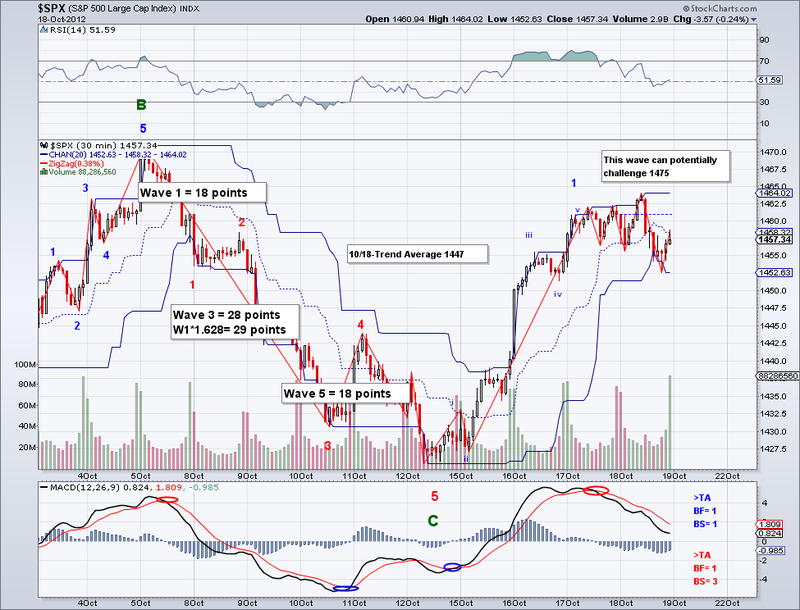 And considering what I posted on Friday, odds do favor the bullish side. That and the fact that mortgage rates on a 30 year fixed loan are now BELOW the historical rate on inflation for the United States, which is financial history in the making. With rates like these, people can borrow or refinance and and basically pay 0% interest (when accounting for inflation). This in turn encourages consumer spending, investing, etc. I'd love to see 3.15% on the 30 year. That is where I refinance my loan with a big smile on my face :) Btw I mentioned that if my emerging market guess was accurate that I would "retire". And what I meant by that was not retire as in not doing anything, retiring to me means having the freedom to do whatever you want without having to worry about income. I'm not exactly a "workaholic" but I could never quit being in business, investing or just being productive in general regardless of age or how much money I have saved. I guess being productive could be considered a hobby in itself.